AdBlue Emulator EURO 6 NOx for Scania trucks is compatible only with EURO 6 type vehicles. This emulator won’t work with EURO 5 vehicles or vehicles made by other manufacturers. This installation manual describes all steps necessary for correct AdBlue Emulator device installation on compatible Scania EURO 6 vehicles. We highly recommend you to delete all DTC (Diagnostic Trouble Codes) errors from OBD (On-Board Diagnostics) system. The best option is to use Scania VCI 2 or Scania VCI 3 diagnostic scanner. If you noticed new OBD DTC errors after installation, please check the system again with the diagnostic scanner. There might be errors related to incorrect installation. For the safety reasons we highly recommend to start the installation by connecting a ground wire. This emulator doesn’t require an additional programming or learning and we sell it ready to use. Let’s start by locating an EEC ECU (Electronic Control Unit of Selective Catalytic Reduction system). It is located in the centre of the vehicle frame. There are two big plugs and one of them is pink. You need to connect the emulator to the EEC plug, to make it properly check out the table below, it shows which wires of the emulator must be connected to corresponding wires of the plug. Please read the table carefully and make sure you really use the proper wires, you can identify them by the pin numbers of the plug. Now you need to cut the green wire of PIN 12 in the EEC plug. 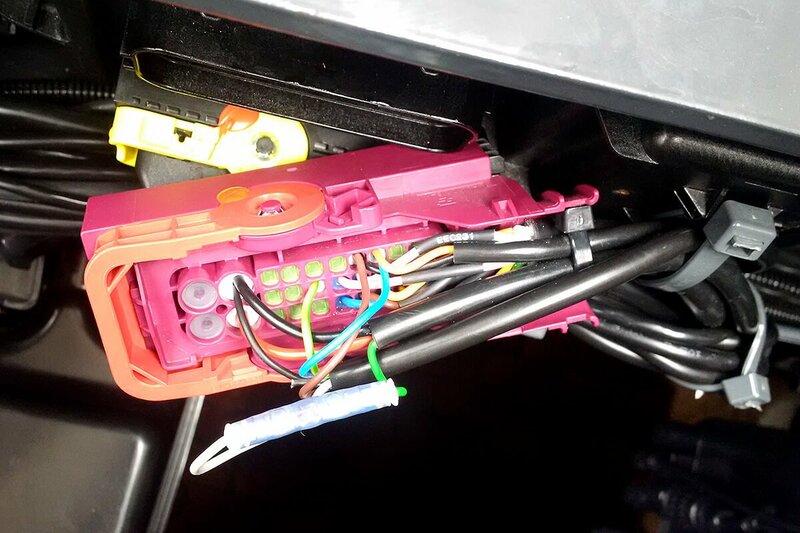 Take the end of the green wire that goes to the vehicle and connect the gray wire of the emulator to it. Take the end of the green wire that goes to the EEC ECU plug and connect it with the green-yellow wire of the AdBlue Emulator module. That’s it, connection process completed. You can control the emulator by switching it ON or OFF thru the vehicle BC. Enter the vehicle BC menu and select “Vehicle Data”. Now if you want to turn AdBlue Emulator ON, please read the state of ECU three times within period of 10 seconds. And if you want to turn AdBlue Emulator OFF, please read the state of the ECU two times within period of 10 seconds. AdBlue Emulator EURO 6 NOx installation manual for Scania trucks was last modified: November 21st, 2017 by Cardiag Inc.